Solar Impulse 2 is crossing the Arabian Sea in the second leg of its historic attempt to fly around the world. 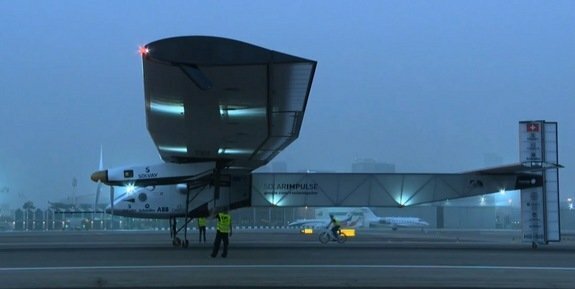 After the briefest of lay-overs, the solar-powered plane took off from Muscat in Oman at 06.35local time. It is heading across the Arabian Sea to Ahmedabad in India. Project chairman, Bertrand Piccard, is now at the controls, having taken over from Andre Borschberg, who flew the first leg on March 9 from Abu Dhabi to Muscat. The second leg will cover about 1,465km (791 nautical miles), and should take about 16 hours. Live coverage of Tuesday’s leg is being relayed on Solar Impulse 2 website. It is expected to take five months in total for the single-seater Solar Impulse 2 aircraft to cross the continents, passing over both the Pacific and Atlantic oceans in the process. However, the round-the-world venture is altogether more dramatic and daunting, and has required the construction of an even bigger plane than the prototype, Solar Impulse-1. Operating through darkness will be particularly important when the men have to cross the Pacific and the Atlantic. The slow speed of their prop-driven plane means these legs will take several days and nights of non-stop flying to complete. Bertrand Piccard and Andre Borschberg – they take it in turns to fly solo – will have to stay alert for nearly all of the time they are airborne. They will be permitted only catnaps of up to 20 mins – in the same way a single-handed, round-the-world yachtsman would catch small periods of sleep. Bertrand Piccard and Andre Borschberg will also have to endure the physical discomfort of being confined in a cockpit that measures just 3.8 cubic meters in volume – not a lot bigger than a public telephone box.